Pic of the Day - Catrike 700 "Black"
Just another nice Sunday ride with a little climbing thrown in. The black container in the boom water bottle holder is where I store my nutrition needs like energy bars. I find that 200 to 300 calories an hour seems to get me through a 3 hour ride. Longer rides require a little extra planning. I take hydration and food seriously. I paid the price more then once for screwing up my calorie and water intake. 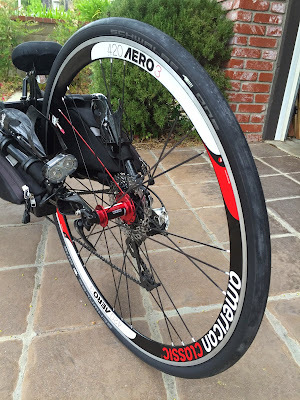 Now that I have the Kojak/DT Swiss XR331 wheelset ready to go on my Catrike 700 "Black" when riding rough roads, I decided to try a new tire with the American Classic Aero wheel for the tame roads. I swapped out the Schwalbe 23/622 Ultremo with a Schwalbe One 28/622 on the light Aero wheel. The trend towards wider racing tires convinced me to give the 28mm tire a try. It seems that larger is not necessarily slower. In racing it's now felt that a 25mm is the fastest tire for both racing and time trials. The 28/622 Schwalbe One is more comfortable then the old 23/622 Ultremo without any noticeable loss in speed. It also holds a straighter line with less rear end shimmy when riding fast on not so smooth roads. Having the 28/622 on the Aero opens up more riding situations where I'll want to use it. As for speed...there is a downhill run close to my home that is nearly a mile long with smooth pavement. I use it to judge speed. At 35 mph I stop spinning and let gravity take over. The front tires are Schwalbe 23/406 Ultremos. This year I have used three different tires on the rear and two different rims and hubs..
50.0 mph - 23/622 Schwalbe Ultremo with American Classic rim and hub. 50.2 mph - 28/622 Schwalbe One with American Classic rim and hub. 47.2 mph - 35/622 Schwalbe Kojak with DT Swiss rim and hub. The only way to go a little faster (without a fairing) would be to ditch the baggy wind catching shorts and slip on some Lycra. I'll try it one day. Today's ride made up for the last two "crappy weather" rides. I got my mojo back today. Did a little climbing to get a better view of this perfect day. I've played around with different combos of cranks and cassettes for some time now. 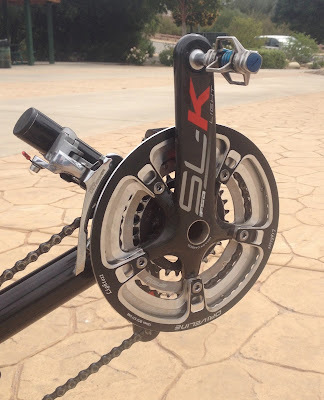 I've been using a 10 speed 11/36 cassette with my 52/39/28 SL-K crank for the past few months on my Catrike "Black". It's a good compromise between the need for climbing gears and the need for speed. The chain gets a little sloppy when going small/small (11t cog and 28t chainring) but there's no need to go there. The 28t after market chainring replaced the SL-K 30t chainring. The Driveline Lightest chain guard is a lighten down version of the FSA chain guards Catrike supplies with their trikes. I use it primarily to avoid the usual "you're going to cut someone with that chainring sticking out like that" comments. Devin Skelton - Video "Catrike commute home - DUDE!" Devin Skelton's video shows that some motorist encounters can be pretty funny and cool. Although a bit scary at first. Watch. 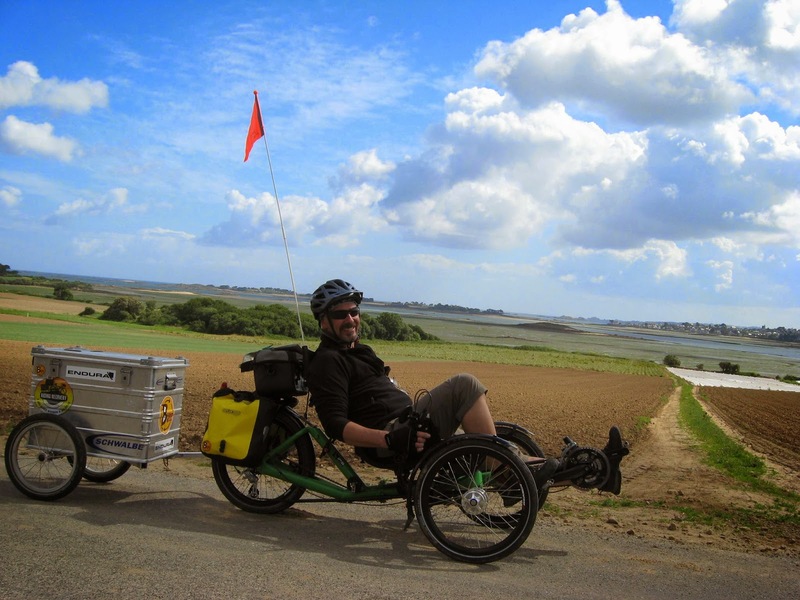 Graeme's blog "Graeme Willgress - Round Britain Cyclist". Visit the Trikes and Trikers page. I took some time out on this kinda rainy day to visit Dana and the gang at Bent Up Cycles. Inventory is better then ever. When a 61 year old guy (me) riding a recumbent tricycle and wearing baggy shorts and who has had two hips replaced, lumber and thoracic back surgery, a heart attack and who can out perform many of his peers and many other MAMILs (middle aged men in lycra) on "traditional bikes", what does that say about cycling? Maybe it says that recumbents have a distinct advantage in many situations. 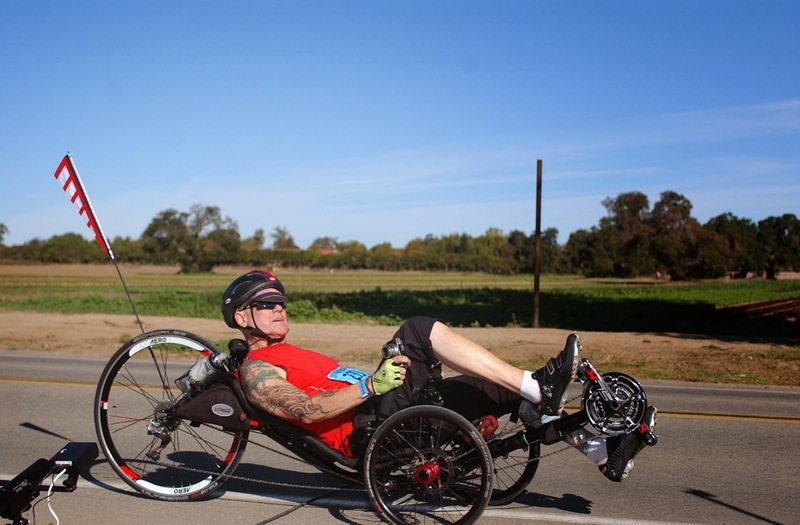 Riding a recumbent trike allows by aging bones and muscles to be more efficient. 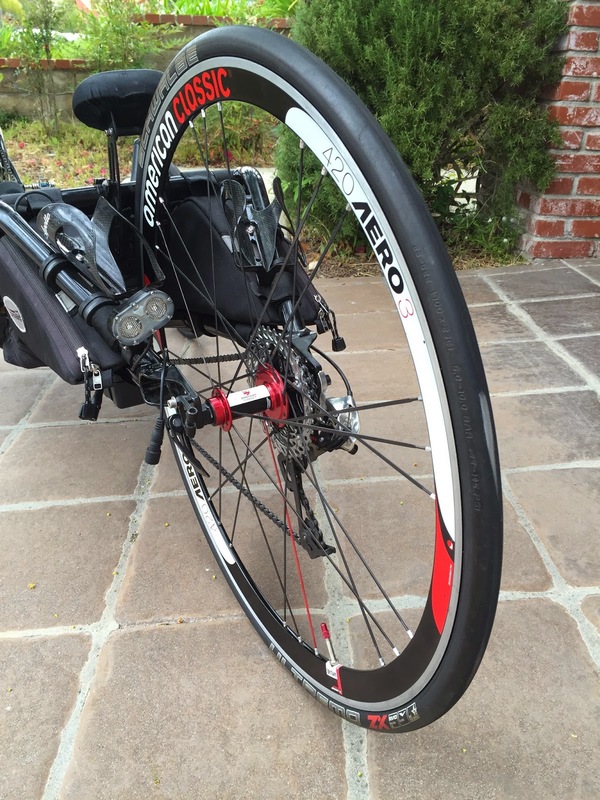 It's estimated that normal non-faired recumbents are pushing up to less then 20% to 25% air then a standard upright bike. At speed this makes a huge difference. So (here I go again on the UCI) why doesn't the UCI allow racing cyclists the opportunity to be faster in events sanctioned by the UCI? Whether it's a traditional bike or an aerodynamic faired recumbent, let the top racing cyclists have the opportunity to choose the fastest bike for any given race or record attempt. The UCI says it's about the athlete and not the bike...bull. The cycling industry has a big investment in "real" bikes and the UCI is protecting that investment at the cost of not expanding the industry and making it more exciting. The materials have changed but the UCI definition of a bike has not significantly changed since the 1930's. The UCI should allow racers to up their game by updating the their definition of a bicycle. More important it would send a message to recreational cyclists that alternative cycling options exist and are acceptable. I see many folks around my age (and some younger) looking out of place and uncomfortable riding expensive high end road bikes trying to "fit in". 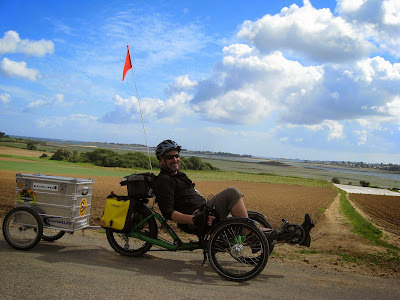 Maybe someday riding a recumbent might be "normal". While riding through a construction area at 25+ mph a nasty high pitch grinding sound suddenly comes from my left front wheel. I thought my wheel was disintegrating. I got over to the curb fast, stood up and lifted my trike onto the curb. I realized the sound was coming from the brake. After my efforts to adjust the pads showed no promise I looked a deeper and saw the gouged BB7 brake pad and mangled spring. I took off the wheel, took out the pads and rode with one brake to a place where Carrie could come bail me out. Riding with one brake is doable but not safe. The road was extremely rough, more like a washboard, and I should've taken it a little slower...but I didn't. The vibration must have shaken the spring loose and it got between the pads and the rotor (rotor is fine). 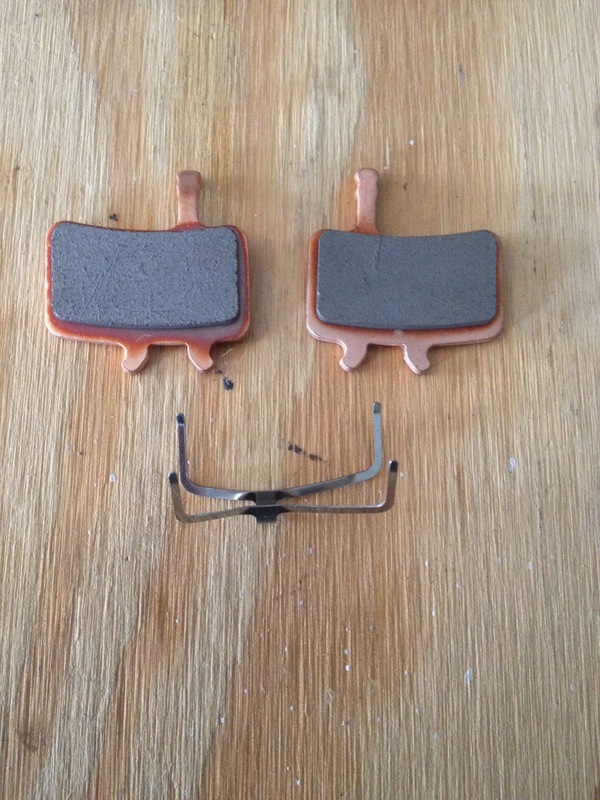 I went to buy two new sets of BB7 brake pads at my LBS. 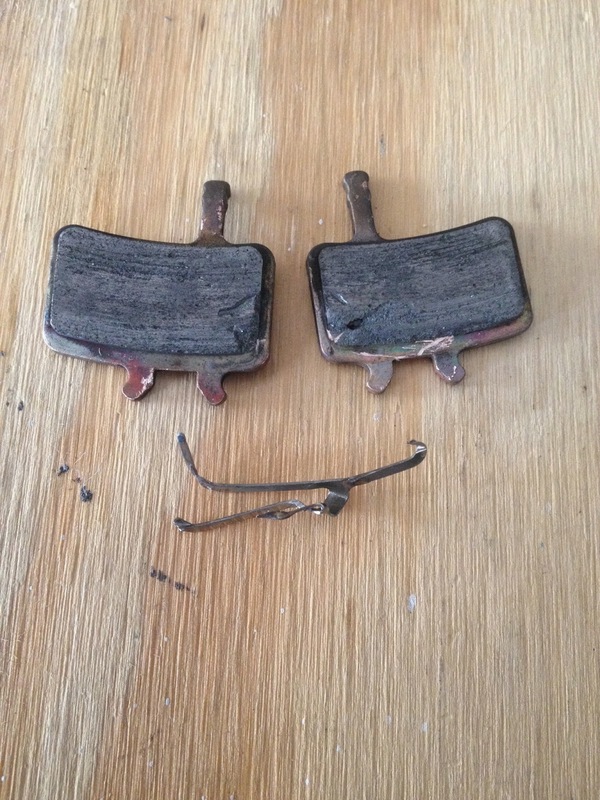 The mechanic told me that it is rare to have a brake pad spring fail. But the chance of failure increases has the pads wear down. My pads were at a little less then 50%. It's easy to replace the BB7 pads, even while on the road. I'll add a set of new pads to my on board tool kit. New BB7 pads and spring.